This episode was based on the short story 'The Chocolate Box', first published in 1923. It was adapted for television by Douglas Watkinson and directed by Ken Grieve. The extraordinary thing about the short story on which this adaptation is based, is that it consists entirely of a monologue by Poirot, with certain comments from Hastings. It recounts a case Poirot conducted while he was a member of the Belgian police force - his failure. Douglas Watkinson's script is a wonderful attempt at bringing this story-within-a-story to life. Most importantly, he creates a completely different framing story that enables Poirot to be back at the scene of the crime, so to speak, in Brussels. In the adaptation, Hastings is replaced by Chief Inspector Japp, who has been appointed a Companion de la Branche d'Or of Belgium, one of the country's highest distinctions, for his services to the Belgian police force ever since the Abercombie forgery case (mentioned in Christie's novel The Mysterious Affair at Styles as the first time Japp and Poirot collaborated). Poirot accompanies him to Belgium, since his wife Emily (mentioned throughout the series, but she never appears) is unable to come. As a result, Poirot is back in his home country, which in itself is a joy to watch, but more importantly, that enables him to reacquaint himself with Claude Chantalier and Jean-Louis Ferraud, old friends who worked with him on the case. Poirot and Chantalier start discussing the case, and Poirot recounts the story to Japp as a 'disinterested party'. These changes are very sensible, and they bring the story vividly to life. Another important change is to expand the hints of a love interest between Poirot and Vergine Mesnard. For one thing, she doesn't end up in a convent. Instead, she marries Jean-Louis and has children, Henri and Hercule (a sign of her affection for him). But, more importantly, she gives Poirot his lapel pin! And he calls her by her first name, Virginie - the only woman (except Ariadne Oliver and several kitchen maids) who has this 'honour'. Watkinson also makes certain small changes, like replacing the English character John Wilson with a French one, Gaston Beaujeu, and not letting Poirot disguise himself as a plumber, but all in all, this is a faithful and emotional retelling of the short story, one of the best entries in the series. Ken Grieve's direction for this episode is absolutely great. He makes excellent use of the locations, and conducts some neat transitions between the time periods (1930s and 1900s). For instance, the camera follows a bus driving past the Deroulard household, which is replaced by horse driven carriages to convey the shift from present to past. Several similar examples occur throughout the episode. The locations and the sets are beautiful to look at, and it's so nice that they make the most of the 'foreign' location. Antwerp Station (not in Brussels, obviously), was used as Gare de Bruxelles. Gunning's soundtrack for this episode is particularly memorable, with a lovely love theme for Virginie and Poirot. David Suchet does such a brilliant job in this one. Seamlessly, he manages to portray both the young and energetic Poirot and the middle-aged Poirot. The hair piece and the somewhat more natural hair colour contribute to the effect, of course, but it's his acting, particularly in that end scene where he is reunited with Virginie, that he really lets his experience (and Poirot's melancholy) set in. The way he gently touches the vase is such a nice touch. All the guest actors in this adaptation do a brilliant job, too, with Anna Chancellor (Virginie Mesnard) and Rosalie Crutchley (Madame Deroulard) as the real standouts. In the original, Poirot really does more or less bungle the investigation. Here, he didn't, but allowed others to think he did as part of the cover-up. It is as if the producers, writers, or perhaps, Suchet, would not accept Poirot ever failing (at least, at this juncture, because one or two of the later episodes, especially, Labours, end very un-triumphantly). This is also a case that people discuss because it's an example of Poirot NOT insisting that the justice system take its course. While the killer is terminally ill, that doesn't appear to be the only reason for Poirot's decision: he expresses actual admiration for the killer, or at least, uses phrases with an admiring connotation, like "sacrifice" and "moral courage." Different from MOTOE where he screams at the killers for "taking the law into your own hands." 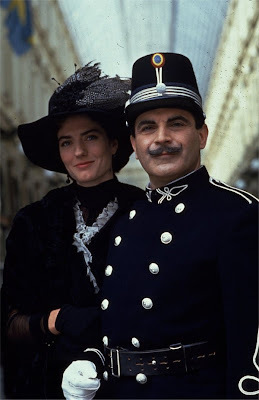 If you go by what Suchet has to say about the significant events in Poirot's life, he (Suchet) seems to place more significance on Poirot's relationship with Virginie than on the one with Countess Rossakoff. In the "Poirot and Me" TV special, Suchet emphasizes this as "the one time Poirot does fall in love" and doesn't mention The Double Clue. We might ask, then, what stopped Poirot from pursuing Virginie further? By the time he returns in the present day, of course, she's married to Jean-Louis, but she doesn't seem to be involved with him when the case is happening. With Countess Rossakoff, the answer, of course, has to do with her criminal tendencies whether that's a moral stance on Poirot's part, or that having a thief for a wife could ruin his reputation, or simply that they're opposites. Would it have been considered dishonourable, or taking advantage, for Poirot to pursue her, given the circumstances in which they came together? Her marrying Jean-Louis really seems like settling for as close as she could get to actually marrying Poirot! I couldn't watch this episode again without trying to find the solution to the gap in time between Poirot's falling in love and his having to flee to England. Surely he realized that Virginie and Jean-Louis were seeing each other. Then, in The Double Clue, he tell the Countess that he had been the head of the police force in some area of Belgium. The timeline just doesn't fit with his forced exit from the country (unless he was "slightly" exaggerating, as with his flat statement that he was regarded as the greatest detective in England). And then, back to Virginie and Jean-Louis, what the heck was Poirot doing about his friends while he was rising in the ranks? Both questions will now bother me excessively. I will listen more carefully the next time through the series, beginning tonight! I wondered why, in the scenes set in Belgium (with the characters all presumably speaking French), Poirot is still speaking with an accent? Wouldn't it have made sense for him to speak without an accent since all of the characters would have been speaking their first language? I think it would have been an interesting way for us to "hear" what Poirot sounds like in his native tongue. --Kat D.
He sounds the same in his native tongue! Surely it would make more sense for everyone else to speak with an accent too. I wondered why, at the end of the Chocolate Box, Poirot seems to smell Virginie's hand instead of kissing her hand? When a gentleman 'kisses' a lady's hand, he's not actually supposed to touch her hand with his lips but rather bring them to about a centimeter or so from her hand and hold that position for a second or so. The opera which Virginie and St Alard attend (thus allowing Poirot time to enter the house) is Borodin's Prince Igor. A four and a half hour epic - ample time for Poirot to search through the evidence. Does anyone know the music that was used in this episode?